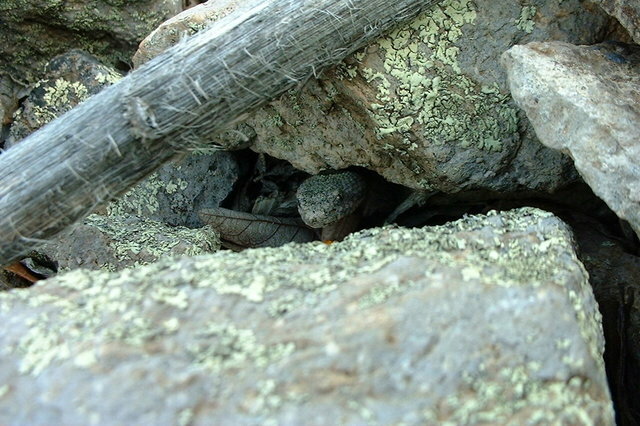 Like most visitors to Arizona, I had never heard of a rock rattlesnake when I first visited the Chiricahua Mountains in 1999. But there he was, a rattlesnake in miniature with gorgeous markings and a big personality. I was completely taken by this little snake, and he changed the course of my life; I gave up working with overtly impressive raptors and was determined to get back to Arizona to study rock rattlesnakes! Male rock rattlesnake, circa 1999. Besides being a wonderfully handsome animal, rock rattlesnakes, like Arizona blacks, live in gorgeous country that offers shade and sometimes water. They are active primarily during the day, which helps a human observer really get to know how these snakes spend their time. A good friend (and inspiration behind some of our research methods) has been watching generations of rock rattlesnakes in a handful of areas in southern Arizona. His quiet, careful approach, diligent note-taking, and devotion to the animals has allowed him to recognize individual snakes over many years and throughout their lives, all with minimal or no handling of the animals. Like me, he was taken with these snakes, whom he calls friends. This summer our friend has been monitoring a pregnant female at a really great nest site: an appropriate-sized shelter rock surrounded by bunchgrass, making it difficult for most predators to see the basking female or her family when they arrive. Most predators. When my friend checked on this particular mother-to-be recently, he noticed a whipsnake hunting nearby. Whipsnakes are known predators of rattlesnakes, so he returned the following day to find out if she had evaded the predator. He found her at 8a.m., still pregnant and secure under her nest rock. He left her to check in with some other snakes and returned three hours later. The bunchgrass that had surrounded her nest and provided cover had been flattened by hiking boots. The shelter rock itself, had been flipped and tossed aside. And the mother-to-be was gone. It's easy to get taken with snakes, especially beauties like rock rattlesnakes. But just because you are taken with them, doesn't mean they should be taken by you. The effort required to find a site where you can observe wild snakes is well worth what you'll be rewarded with: behaviors you'd never see snakes do in captivity. Enjoy snakes in their home, don't take them home with you. *Although widely distributed across Mexico, west Texas, and New Mexico, rock rattlesnakes are found in just a few mountain ranges in Arizona. Because of this, and because snake fanciers around the world seek them out for their collections, rock rattlesnakes are protected in Arizona. Unfortunately the demand for these animals outstrips the willingness of some to abide by law. Find a rescue. There are so many wonderful snakes that need homes. In Arizona, check out Tucson Reptile Rescue or locate a rescue near you. Can't find a rescue? Buy captive bred. Don't collect. Don't buy wild-caught animals. If you like this story, read more like it and learn more about Advocates for Snake Preservation at our website.